One of my favourite castles, Kendal Castle is a shadow of its former self. Neglected by generations of Parrs and subsequent owners, we're really lucky to have any remains here at all. So much has vanished and been quarried away over the years, that its surprising just how much remains looking over the town. Kendal Castle is visible from all roads leading into the town, and I think this is what gives the castle its charm. The seasons also play their part, giving the castle many different looks throughout the year. Above. The castle, probably from Castle Howe. Above. The castle from Low Fellside. Above. The castle from Scout Scar to the West of Kendal. Above. The castle from Castle Garths to the West, just below Castle Howe. Above. The castle from Sedbergh Road near the Castle Green Hotel. Above. The castle, looking East from the top of Captain French Lane. Above. The castle looking East. Castle Howe, Kendal’s first castle, lies on the hill side over looking the West of the town. The earthwork remains are sandwiched between Gilling Gate and Beast Banks, and are easily accessible from both sides by footpaths. Above. Castle Howe with the beacon on Castle Hill in the foreground. The remains consist of an extremely well defined motte, rising to around 11 metres, and around 18 metres in diameter at the summit. The base of the motte measures around 160 metres, and is surrounded by ditches and embankments. 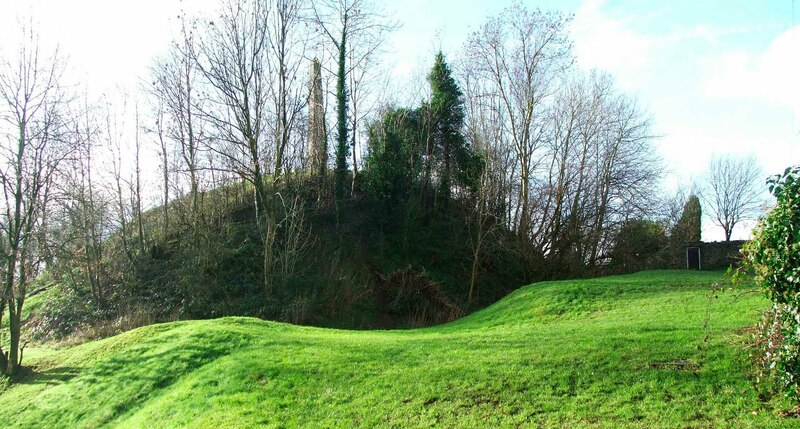 The bailey lays to the East of the motte, and is roughly triangular in shape, and has been destroyed by the creation of a public park, once a bowling green. Above. Castle Howe from Castle Hill to the East. There have been numerous dates put forward for its creation. One suggested date is 1092, a date which ties in with the invasion of part of Westmorland by the Normans in their push North. Above. Castle Howe from the East looking across Castle Hill. The Barony of Kendal fell at the hands of Ivo de Taillebois at about this time. Ivo was brother to the Earl of Anjou, and an avid follower of Duke William of Normandy, supporting the Duke in his invasion of England in 1066. As a reward for his unfailing military support and success, Ivo was granted the Barony of Kentdale, a title that brought with it huge swathes of land in what is now Yorkshire, Lancashire and Cumbria. Above. Castle Howe in Winter. As well as Castle Howe in Kendal, Ivo also has connections with Kirkby Londale’s motte and bailey castle on Ruskins Brow, and towns right across the South Lakes area, including Beetham, Kirkby Stephen, Kirkby Lonsdale, Heversham and Burton in Kendal. Above. The base of the motte on the North side. Kendal Castle, to the East of the earthworks, may have been built whilst Castle Howe was still being used. There’s no evidence to suggest that Castle Howe was directly replaced by the new castle the other side of the river. If anything, there’s every possibility that Castle Howe was the baronial centre of Kirkland, and that Kendal castle was the baronial centre of Kentdale. Above. The memorial to the Glorious Revolution. Castle Howe eventually became redundant, as did the castle, and the administrative centre of Kendal moved to the Moot Hall in the centre of town (Now occupied by Thorntons). Above. Castle Howe from the bailey area. In 1788, to celebrate the centenary of the revolution of 1688, an obelisk was erected on the summit of Castle Howe. The monument was designed by Kendalian architect Francis Webster. The earthworks are now looked after by South Lakeland District Council, with information boards placed at the foot of the motte. Above. The motte from the North East. 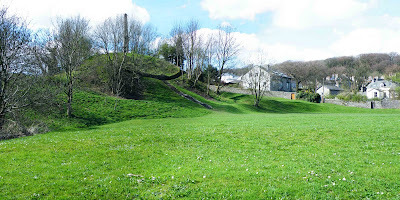 The Saturday Magazine, (published in 1833 by the committee of General literature and education), indicates that the site was once known in Kendal, as Castle-Law Hill....which it claims indicated that local justice was meted out from the flat summit. A map of Kendal, dated 1863, also shows the motte and bailey with this name. (The motte is also known as Castle Low Hill...so the motte appears to have been known by a number of names in the past) Indeed, anciently, Moots, or Moot Hills were traditionally places where the law was upheld, a place where the judiciary would meet to decide on local cases brought before the elders or judges. Above. The foot of the motte looking up the stairs on the South side. Other traditional explanations accredited to Castle Howe, state that the mound is the remnant of a Roman watch station, or even a siege work, thrown up when Kendal Castle was being attacked (by whom I'm not sure, but there's no historical indication that the castle was subjected to any military action) Local tradition was that Kendal Castle was 'knocked about' by Oliver Cromwell, but it's now known that Cromwell paid little or no attention to Kendal, and the castle probably saw little or no military action against it. Above. Looking across the bailey to the motte. So Castle Howe has not always been recognised as a motte and bailey castle....indeed it is only in the past 80 years or so that its true nature has been identified, and the many uses and reasons for its existence are readily identifiable when inspecting old maps of the town.